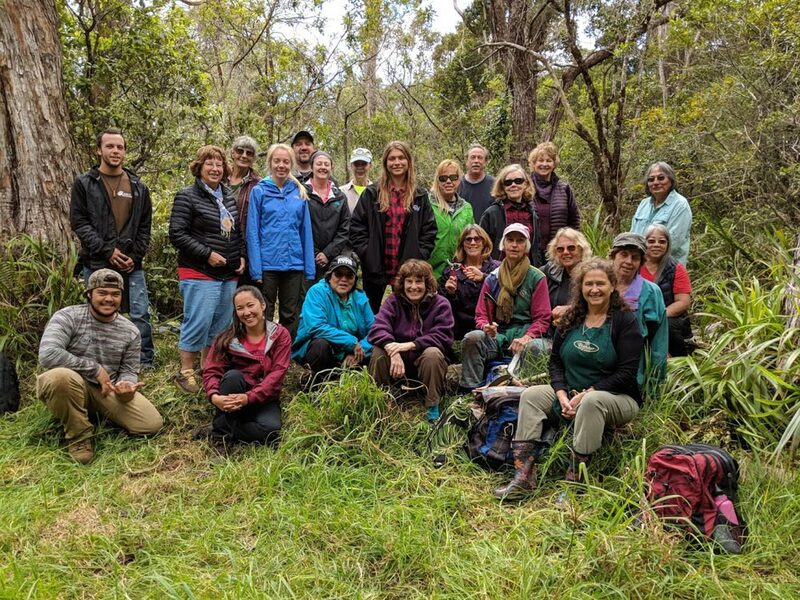 On Friday, March 1, 2019, our Ka ’Imi Institute was in Kokee to work with the Kauai Forest Bird Recovery Project. The puaiohi, ‘akeke’e and ‘akikiki are the forest birds being studied, with the hope of increasing their numbers. 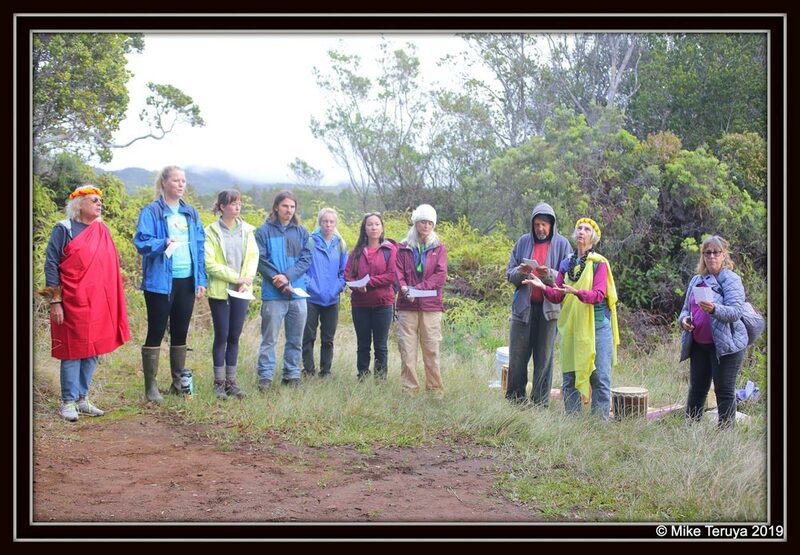 Other groups represented were Kauai Invasive Species Committee (KISC), Hui O Laka, Kokee Resource Conservation, National Tropical Botanical Garden (NTBG)/KUPU, and Kauai County Council. It was a wonderful and productive collaboration in the beautiful upland forest. We began with instruction on the procedure for cleaning shoes and tools to make sure the spread of Rapid `Ohi`a Death (ROD) is controlled; to date, there is no ROD in Kokee. We then danced Kaulilua for the people gathered by the pavilion in the meadow, which included a group of school children from Oahu. Then the girls and boys from the school shared their hula with all 60 of us: what a great moment of being with enthusiastic and inquisitive young people. From the meadow, we proceeded by caravan into the forest where Queen Emma stopped for the night during her trek to Kokee in 1871. We again performed Kaulilua, as well as several chants, including Ua Wehe Kaiao composed by Keahi Manea. A representative from each group then shared their intention and goals for their group for the coming year. Everyone there then said, “ `o ke aka `oukou, ka `i`o makou”, meaning “you are the essence and we are the flesh”, and giving the group energy to that goal. Our morning culminated in clearing invasive species – strawberry guava, ginger, blackberries and honeysuckle – from the “hula classroom,” an area close to the place Queen Emma rested. Our work in this area of the forest over the past 10 years has resulted in far less invasive species and thriving native plants such as palapalai, maile, and mokihana. The young native plants that were planted by our group are also thriving. 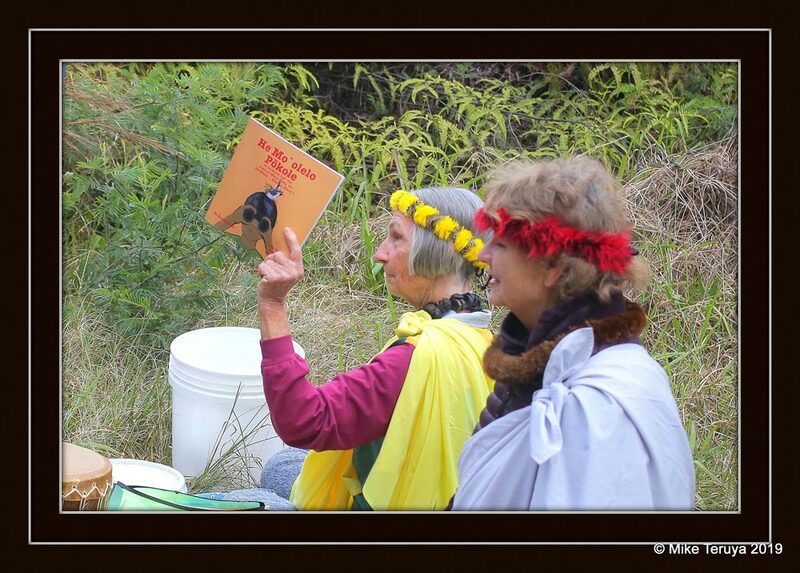 We were visited by many native birds and took that as a sign that our work is appreciated! Sally Jo Manea displays a book she wrote about the Kaua’i endemic forest birds which is written in Hawaiian language.